I really love the way this one turned out, the color contrast is amazing! Two strands loaded with quartz, rich garnet gemstones, delica beads, brass guitar string ball ends, sterling silver beads, bright silver stars, and one of my Lucky 13 guitar picks from Dunlop. Hangs from a thick gauge sterling silver oval ring and held between a silver guitar string ball end. I’ve pierced the top sides twice and added jump rings. From the bottom hangs part of a D string which has been wrapped to form a spiral, a 2mm garnet bead is hidden inside and a bright star hangs from the tip. Before making this necklace all guitar component’s and pick were washed with soap and water. I hope you guys like this one as much as I liked making it! If you want a custom made necklace of your own please feel free to contact me I would love to hear your ideas! 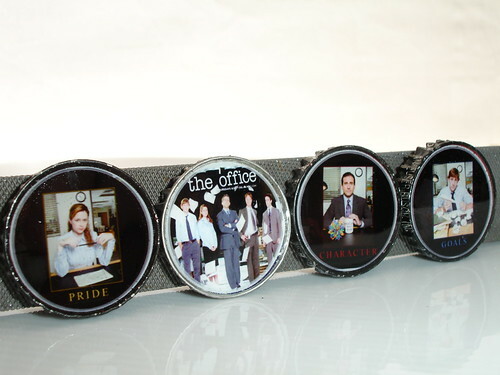 The Office magnet set that I made for my Sister, she wanted a set for well, The Office to show off to her friends. Want one to show off to your friends? Tell me about it! For your consideration is a recycled bottle cap necklace featuring a picture of a farmer in the wheat fields which I’ve upcycled from one of my favorite brews; Boulevard Wheat. The hard working farmer sweats in the sun but don’t worry as he is encased forever in super shiny, crystal clear high gloss resin. To compliment the charm I’ve embellished it with a vintage, green pressed glass leaf and two berry / flower clusters comprised of freshwater pearls and a brown vintage Czech glass bead, all wire-wrapped to the charm using sterling silver wire. He comes with an 18” ball chain that can be cut to size. This pink wrist cuff has gold embossed clover leaves or flowers in a beautiful pattern through out. It is super soft and comfortable. Two shiny rust proof snaps provide closure. Extremely high quality photo magnet featuring Jim and Pam at her desk from the NBC hit show The Office. The two are encased forever in super shiny, crystal clear high gloss resin. A magnet is permanently attached to the back. High quality photo magnet featuring Michael Scott, Jim and Pam, Ryan, and Dwight K. Schrute, behind them are boxes of paper and above it says the office. They are encased forever in super shiny, crystal clear high gloss resin. A magnet is permanently attached to the back. Want something special? I love doing custom orders! Extremely high quality photo magnet featuring Michael Scott from the NBC hit show The Office. Michael is encased forever in super shiny, crystal clear high gloss resin. A magnet is permanently attached to the back. Perfect for your boss or any fan of The Office! Extremely high quality photo magnet of Dwight K. Schrute peering out from his workspace / office (as he wanted to think) from the NBC hit show The Office. Dwight is encased forever in super shiny, crystal clear high gloss resin. A magnet is permanently attached to the back. Do you have a favorite moment from the Office? Tell me about it and I can make a custom magnet set just for you! Bubbles come to the surface amongst the beating waves of the ocean.. I jazzed this one up a bit with hand-set, vintage brass spots in a nickel finish arranged in a wavy formation. They meet up to a semi-circle in the middle and have been highly polished for the ultimate shine. Genuine leather, blue and perforated was reclaimed from an unwanted belt. The leather is in perfect condition and is soft and comfortable. Two shiny rust and tarnish proof snaps provide closure. Top quality, genuine Italian leather cuff beautifully crafted from 100% recycled leather. Two slits are centered down the middle with vintage brass studs to each side of the ornate medieval looking concho. Cuff will be carefully packaged and shipped within 24 hours of payment received. Sent via USPS first class mail.